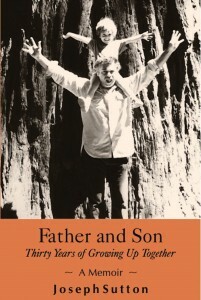 Father and Son chronicles Joseph Sutton’s relationship with his son Ray, giving a year-by-year account of his thoughts and feelings for Ray as he grew from an infant into a man. While writing his journal entries, Sutton had no idea that they would someday constitute a book. As a result, his fatherly concerns, assumptions, insights, imperfections and range of emotions are openly revealed. Whether you’re a father or mother, son, or even a daughter, you will benefit from reading about Sutton’s 30 years of growing up with his son, with all the ups and downs involved in a healthy father-son relationship. “You’re a good teacher,” he said. Well, that was a nice compliment from my son. Then I asked him what he was good at. He came toward me and gave me a big hug. Raymond has been sick again for almost two weeks. I feel so sorry for him because his thinking is in the “negative zone.” He’s always down on himself. He worries too much. In all his eight years I’ve never seen him like this. I was working at my desk today when Raymond came in to tell me he’s having trouble with the portable typewriter I bought him at Goodwill last week for $18. “Dad, something is wrong with the typewriter. It’s not coming out dark enough. Is it because I’m not hitting the keys hard enough?” I told him, “It probably needs a new ribbon. We’ll go to the store when I finish what I’m doing.” Last week he picked up typing really fast—putting eight fingers correctly on the keys. “Follow the exercises in the book,” I told him. “That’s how I learned how to type when I was your age.” He’s been sticking to the correct way instead of pecking away with two fingers. He gets nothing but praise from me when I see him do that. It was like winter today—foggy, windy, cold. I didn’t even feel like getting out, but I knew I was going to drive Ray to his baseball game. I froze out there. I watched my son hit the ball better than kids two and three years older than him. His swing is really nice. Coming home, I stopped at the bank to get some cash, and while I was inside, Ray struck a match or two that he found in my glove compartment. When I got back to the car I smelled matches. Ray denied doing it. He was not going to get away with playing with matches and lying to me. So as soon as we got home, I sent him to his room. He is not going to be able to watch TV tonight or tomorrow. Also, he will not receive his allowance this week. This punishment wouldn’t have happened if only he had told me the truth. The kid is talented. He can hit a baseball, his artwork is interesting, he can write stories and he can type. I love him. Yesterday he came home and showed me his school’s monthly magazine. In it there was a paragraph he wrote about what he learned during his school’s “Ocean’s Week.” His drawing was also included. He seems to be a boy who can take in a lot and express it in a succinct manner. There is one thing Raymond loves that could eventually be his downfall: television. If he had his way, that’s what he’d be doing in his spare time. He would watch television over hitting the ball, riding his bike, reading or learning. I hope he’ll overcome that someday. Last week I went with Ray and my friend Alan Blum to see Field of Dreams with Kevin Costner. Tears came to Alan’s and my eyes near the end of the film as Costner’s character, Ray Kinsella, was throwing the baseball back and forth with the ghost of his father who, like the other old-time players in the film, suddenly appeared on the baseball field from out of a cornfield. Tears didn’t come to Ray’s eyes, though. My son and I have played catch many times, but I bet that thirty, forty or fifty years down the line, if he ever sees the film again, tears will stream down his cheeks. Ray talked me into taking him bowling today. He threw a nice ball except it went into the gutter 99% of the time. I detest bowling. It doesn’t come anywhere near to being an exercise. Bowling, to me, is a waste of time and money. After we finished, I went for some popcorn while Ray was playing a pinball machine. As he was playing, two older boys walked up to him and broke into his game, unbeknownst to me until he came over to tell me. I went up to the two boys and told them that what they were doing was selfish and cruel. I asked them for a quarter to pay for ruining Ray’s game. They said they didn’t do anything and that they didn’t have a quarter. I was furious at these boys for taking advantage of someone much smaller than them. I felt like grabbing their coats and hauling them out of there. Instead, I told them to follow me to the desk. I told the man at the desk what they had done and he said to them, “Get the hell out of here.” He gave Ray a quarter to start another pinball game. Why do people take advantage of others for no reason other than to take advantage? It’s the ultimate injustice. And, as a father, did I do the right thing? What I really wanted to do was put those kids over my knee. What I would like to have done was get a quarter from them to really teach them a lesson. It sickened me that they would take advantage of a young kid. It also sickened me that I lost my temper with them. I don’t like losing my temper or getting mad—it’s a waste of energy. What would Buddha, Christ or King Solomon have done? They wouldn’t have lost their temper. Maybe they would have sat the boys down and talked to them about not bullying people. Ray and I got a couple of burritos at Gordo’s Taqueria next to Golden Gate Park and ate them at nearby Big Rec, the main baseball field in the park. After finishing his burrito, Ray went up to these three teenagers hitting the baseball and asked if he could play with them. I stretched out on the grass and dozed off. When I awoke, Ray was at bat and hitting the ball like I’ve been teaching him since he was old enough to stand on his two feet. Boy, was I proud father. It wasn’t until I turned 40 that I had enough confidence, with Joan’s encouragement, to have our own child. What a joy it’s been. I wouldn’t trade being a parent, with all its delights and disappointments, for anything in the world. There are so many joyous moments, such as seeing my boy walk and talk for the first time, seeing him learn how to read and write and seeing him hitting a baseball. All these experiences have accumulated into my being very happy to have had a chance to be a father. I’ve had two career changes in my 40s, both having to do with health. The first change took place when I was 44. I was teaching in a high school that had neither windows nor fresh air; plus I had to rush around to five different classrooms between periods. Put all that together, along with the usual stress of teaching 14- and 15-year-olds, and my immune system hit a rock bottom low, which led to my coming down with asthma. Thank goodness schools have a summer vacation. I made a vow to get over this cursed disease, because not being able to breath normally is as close to death as one can get. Summer vacation gave me the time to regain my health. I started walking every morning, building up my stamina from 10 minutes to two hours. With practically every step I took, I could feel my lungs becoming clearer and stronger. My old friend and chiropractor, Sky Diamond, didn’t believe in curing me with prescription medicine, bless his soul. He recommended a diet of fruit, vegetables, whole grains, nuts, a little protein from fish and chicken and to stay away from dairy products and red meat. Due to a regimen of diet, exercise and positive thinking, I was gaining back my strength. I was a new man. I changed careers. I became a sales rep for a costume jewelry company. I was out in the fresh air meeting new and different people. Every day was a new day for me. After four years of sales, after I had accumulated enough money to last two years, it was time to do what I really wanted to do, which was to compile a book of quotations on health. I recently completed the project. The name of the book is Words of Wellness: A Treasury of Quotations for Well-Being. I don’t know what the future holds. All I know is that as long as I have my health, I can do anything. June 16, 1989 — Published! The phone rang at eleven o’clock this morning. It was from Dan Olmos, editor of Hay House Publishing. He liked the 22 sample pages I sent him of my quotation book. He said he was excited with what he saw and that Hay House wanted to see the complete manuscript. Eureka!!! It’s hard to explain how happy I am right now except to say I’m in love with every man, woman and child in the whole wide world. Olmos told me that Hay House has been talking about a health quotation book for the past month and that my query and sample pages came at just the right time. I’ve been waiting for someone to tell me this since I became a writer 20 years ago. I must pat myself on the back for sticking to this project. I kept at it because it was good for my health, and if it was good for my health, then it would be good for someone else’s health as well. I won’t have to sell someone else’s product anymore. Raymond and I have been to several Giants ball games this season, also a couple of Oakland A’s games. Even though Oakland was in the World Series last year, I could care less what happens to them. Ray and I live and die with the Giants. Yesterday we went to one of the most dramatic games we’ve ever witnessed at Candlestick Park. The Giants were trailing the Cubs 3-0. In the seventh inning the Giants scored a run, making it 3-1. In the eighth, it was two outs with Brett Butler on third. Will Clark banged out a single, making it 3-2. Kevin Mitchell, the next batter, hit the first pitch over the right field wall. The Giants were now leading 4-3. The roar of the crowd was so deafening that I had to cover my ears. The Giants are coming from behind consistently—a sign of a championship team. Steve Bedrosian came in to finish off the Cubs one, two, three for his sixth save out of seven since he joined the team in late June. Note: The Giants went on the play the Oakland A’s in the World Series, now known as the Earthquake Series. The Giants were humiliated by the A’s, losing four straight games. My son is getting on my nerves. This past weekend he complained about six or seven things that were bothering him. He’s a hypochondriac and I don’t know what to do to get him off of this except what I told him yesterday: “I’m tired of hearing that something’s wrong with you every minute. I’m tired of feeling sorry for you.” My son is a complainer and a half. He gets on my nerves so much that I’m beginning to relish the time I’m not around him. I’m completely fed up with this type of behavior. Sometimes I wonder if it’s my fault that he acts this way. Maybe it’s just a phase he’s going through. It might be a good idea for Joan, Ray and me to talk about it. Joan and I found out that Ray is having problems in school. It’s not that he’s a bad boy or anything like that; it has to do with having low self-esteem and being lethargic. We’re going to have to give the boy more love. It’s Ray’s winter vacation. I play football with him on the street every day so he can gain confidence in his abilities as an athlete. The kid can play football. He’s very good at passing, catching and learning the game. Raymond and I just got back from taking a four-mile walk—our longest walk together. At times during the walk, he said, “Dad, I didn’t even know I was walking.” He said that because he was explaining to me how well he was doing at a computer game. He was so much into explaining his mastery of hand-eye coordination that he forgot we were walking such a long distance. The kid sure has a gift of gab around those he trusts.